We have way more demand than we can meet right now with a free service, so I am only authorising academic email addresses. However, guest login gives you access to everything that the account version does except save files between sessions. However, you can always download your files after each session and re-upload them. The following information is optional, but helps us figure out who our users are. Why are you requesting a beta account? In order for this website to work properly, we have to store small files (called cookies) on your computer (one that stores your session ID to make sure only you access your account, and 3 used by Google to Analytics to collect anonymous use data). Almost all websites do this, but a new EU law requires that we obtain your consent first. By logging in or registering, you agree to this. WebMorph is a web-based version of Psychomorph, with several additional functions. While WebMorph is optimized for averaging and transforming faces, you can delineate and average any type of image. WebMorph also has several batch functions for processing large numbers of images automatically and can even create moving gifs of your transforms. See the Help Videos under the Help menu to see some tutorials on what you can do in WebMorph. WebMorph now shows 3D faces! We are currently working on morphable KDEF composites. WebMorph is made possible by the kind help of Bernie Tiddeman, who developed and maintains the desktop version of Psychomorph. WebMorph uses the open-source Java library FaceMorphLib and is developed and maintained by Lisa DeBruine. WebMorph is currently in beta testing and is likely to remain so for some time. This means that there will be bugs and you cannot rely on the website being functional 100% of the time. Lisa will try to fix any problems as fast as possible, but she is the only person working on this project, so please be patient. If you're curious about the code or want to help with development, this project is open source at https://github.com/debruine/webmorph. WebMorph now has limited support for 3D faces. You can upload OBJ files and associated BMP or JPEG textures and view them in the delineator. You can also morph between two objects that have the same geometry. I will add further functions soon. New projects contain two example OBJs if you want to have a play. The menu items have changed a bit and I've removed or changed a lot of keyboard shortcuts to make them more compatible between web browsers. See what else is new at What's New? under the Help menu. Your project list is loading. This will take 5-30 seconds, depending on the size of your account. Drag images here to view or compare them. Drag images to reorder and double-click to remove them. Average images by selecting them in the Finder and clicking the average button, or by double-clicking on the average face to add selected images to the list. You can also drag images to the average box to add them to the list. Transform images by selecting them in the Finder and dragging them to the 'image to transform' or 'transform dimension' boxes. You can also double-click these boxes to add the selected image. Paste your batch file from Excel into the box below. Allowed functions in equations are: abs(), min(), max(), tan(), sin(), cos(), atan(), asin(), acos(), sqrt(), pow() and rad2deg(). X- and y-coordinates of delineation points are written, e.g., x (the x-value of point 0). Units are in pixels. The origin (0,0) is in the upper left corner. Create CSV files with the Lab* values for each pixel. Check 'ignore mask' to omit pixel values that are the same as the top left pixel color. Type positive numbers into the boxes to add margins and negative numbers to crop margins. Click on the squares you want to scramble. Drag for multiple select. You can set the current template as a default template so you can label the points and set up custom symmetry files. You can have as many default templates as you like. Select the current default template under Preferences (,). Paste your batch file into the box below (download template). Color is optional and in the form of rgb(R,G,B) or transparent. Paste your batch file into the box below (download template). Shape, color and texture are in percent values (e.g., 50 or 50%). Paste your batch file into the box below (download template). Put the name of each average on the first row and the images in the average in the rows below. Put each average in a new column. This function is experimental and prone to error. Turn a set of images into a moving gif. Paste in a batch file from Excel. Each column specifies one model. Create a PCA model for a set of templates (and optionally analyse them) or analyse a set of templates using an existing PCA model. _model.pca.var.csv = the variance information for each component in the PCA model. Drag each point to delineate the shape of the image. ⇧-click on a point to select or unselect it. -click or ⌃-click on a point to select or unselect the whole line. Hold shift and drag over the image select all points inside the box. Move a group of selected points by moving any selected point with the mouse or using the arrow keys. + and - to increase or decrease the size of a selected group of delineation points. ← and → to rotate a selected group of delineation points. A (or double-click on the image) to unselect all points. Hover over a point to see where it should go (see the footer). -click to add a new point. L to start drawing a new line. Click 'enter' to end the line. L to delete a line. If the video recording is active (but not recording), activating an animation will record the frames so you can save them and create an animated gif (Tools > Moving Gif). If video recording is not active, it will play the frames at the render speed of your machine (probably faster than the duration below). Access the code at GitHub. WebMorph is currently in beta testing and is likely to remain so for some time. This means that there will be bugs and you cannot rely on the website being functional 100% of the time. Lisa will try to fix any problems as fast as possible, but she is the only person working on this project, so please be patient. If you're curious about the code or want to help with development, this project is open source at github.com/debruine/webmorph. To cite the morphing and transforming methods, see Bernie Tiddeman's webpage. You can now create a TPS file for selected images and templates by selecting them and choosing Create TPS File from the Template menu. I've switched the automatic delineation to Face++. You can batch auto-delineate all selected images in the Finder window or auto-delineate single images in the Delineation window. Image grids (under the Tools menu) had stopped working. They're now fixed. There was a bug that deleted the first line of batch transforms and batch edits. It's fixed. You can now scramble inside of a mask, rathe than choosing set squares to scramble. Choose a mask style or set the mask colour from the top left corner of the image. In the batch align, rotate, crop and mask functions, you can now specify the masking colour from an image patch by defining the coordinates of the top left and bottom right corners of the path. For example, if you want to match the median colour of the top 10 rows of pixels, set the patch coordinates to 0, 0 and 2000, 10 (if you set the coordinates outside the range of the image size, it will default to the width of the image). I've made several updates to batch functions so they are easier to use. You can now also upload your batch files as tab-delimited .txt files and load them by double-clicking them in the finder. I've reinstated drag and drop, but will probably refine this in the future to get webmorph to work better with touch screens. Fit points move with the image if you zoom during 3-point delineation. Tem files are updated in the finder when you save a new delineation. The refresh button has been moved away from the save button on the delineation page to prevent accidental refreshes. Checkboxes were not showing as checked in Firefox on Windows. I think they're fixed now. 3-point delineation can now be undone/redone. Dragging files in the finder to move them between folders was causing too many glitches, especially with touch screens, so I've removed this function. You can still move files between folders by selecting them, copying (C) or cutting (X) under the Edit menu, and pasting (V) into the new folder. In the Average and Transform windows, double-click on the image boxes to load selected images. WebMorph now has limited support for 3D faces. You can upload OBJ files and associated BMP or JPEG textures and view them in the delineator. You can also morph between two objects that have the same geometry. I will add further functions soon. New projects contain example OBJs if you want to have a play. Transparency has been fixed in the masks and blur works better now. Transparency with blur still looks a bit odd, so I would keep blur to 0 or 1 on images with transparency. As always, masks are smoother on bigger images, but take longer. There is now a checkbox in the batch masking interface to specify a reverse mask. I fixed some glitches in the scrambling interface. You can now make very fine grid scrambles and the offset works correctly. You can also create symmetric scrambles, where the scramble order on the left side of the image mirrors the scramble order on the right side of the image. I had to remove several keyboard shortcuts because they were incompatible with some web browsers. I also removed most of the keyboard shortcuts for batch functions. Do let me know if you have an idea for a useful new keyboard shortcut. Batch transforms now handle comma-separated lists and relative file names. Percent symbols (%) are now optional in the shape, color, and texture columns. File histories are now saved and displayed in a way that is easier to read and replicate. Added methods to keep selected files and folders in the Finder window between page reloads. Some of the template editing functions were broken because of other changes. These should be fixed now. You can now visualize templates and save them as PNG files with the Visualize Template (D) command under the Batch menu.. I updated how the project sizes load so that initial loading of the project list is faster. You can now delete projects if you are the owner. Please be careful; it is not easy to undelete projects. You can turn on the Light Table under the View menu to compare images dragged onto the Light Table. Double-click on images to remove them. WebMorph is now more compatible with touch devices. Let me know if there is anything you can't do on a touch device. There is a new Batch function called Batch Edit (E). You can align, resize, rotate, crop, mask, symmetrise and/or mirror images in a single step from a batch script. I've also provided demo scripts for batch edit, batch average, and batch transform. Just download them and open them in Excel. The finder shouldn't reload all of the time and should load images from the queue as they are made. There are definitely a few bugs, so just refresh (R) the finder if your file structure doesn't look right. Projects can now have read-only members. Click on the A or R next to a project member's name to toggle their access permission. I have not yet thoroughly checked that read-only members cannot make any destructive project changes, so please be careful and only add project members you trust. Template conversions can now handle templates without images. We also added a new template: the 129-point template from Scott et al. (2010) PLoS One for use in Geometric MorphoMetric analyses. I also fixed some bugs with the new file namer for batch functions. Check out the new batch scrambling function! If you right-click on a delineation in the Delineation window, you can now see a contextual menu to download SVG files of the delineation (all, lines only, points only, or numbered points). Open this file in a text editor to see how easily you can change the line and points colours and widths. Drag the file into a web browser to view it. Now development messages are only shown once per account, so you don't have to close them every time you reload the page. I've also made a lot of small changes to tidy up the code. Let me know if it breaks anything. You can now select folders and apply batch functions (and deletion) to several folders at once. You can also bypass the confirmation dialog when deleting files and folders by using ⌫ or -backspace. This is likely to be a little buggy at first, so make sure you back up your important files regularly (which you should already be doing). I fixed several bugs in the continuum and grid transforms. I also added a new batch function for multiple continua (e.g., morph from A to B to C to D...). Watch out, it might still be a bit buggy. Account registration is now done automatically through the website and account requests are put on a wait list. Project sizes are now only calculated once at the beginning of a session and after changes are made to the project. This prevents long delays when switching between the project window and other windows. You can now drag files to the average face in the Average Window to add them to an average. This is useful if you want to average images from more than one folder. You can also include the same image more than once. The first image in the list provides the height and width for the average image and also the coordinates for 2-point or rigid-body alignment. All group members can add and delete both members and files. Any WebMorph user can be added to a project by their email or name. The original owner cannot be removed from the project. The original owner is the only person who can delete a project. All files in a project count towards the project owner's space allocation. Contact Lisa to change your space allocation. If you are over your space allocation, you will not be able to save or upload files until you delete things (and empty your trash). I am planning to add permissions for project members so you can have read-only members, but that might take some time, so make sure you trust the people you add to a project. As always, please back up important projects by downloading and saving the files. Deleted files are now moved to a Trash folder that is viewable through the View menu. The ability to empty the trash folder will be added soon. The Kinetic library had been causing many crashes, so I've removed that and now the delineations are done somewhat differently. This won't cause much difference for most users, apart from some cosmetic changes in cross and line highlighting. For now, deleting lines is no longer possible (although you can still undo them if you're creating a new template). The functions that average and transform images have been re-written. For the most part, you won't notice any difference. Estimated processing times for manual (not batch) averages and transforms are given in the footer now. These will become more accurate as I collect more data. You can now create larger averages (bigger image size and/or more images per average). As I collect more data, I will add a function to warn you if averages are likely to fail. Fixed a bug that prevented queue items from being cleared, paused, or restarted. The average and transform windows no longer only show images that have a tem file. If you choose an image that has no tem, you won’t get a warning message, but your average will not include that image. If you try to transform using an image with no tem file, the transform will fail and you will get a blank error window. I’ll fix this so you get appropriate warnings as soon as possible, but I am very busy until mid-December. Use + and - to increase or decrease the size of a selected group of delineation points. I'm reorganising the menu items, so their location and shortcuts will be changing a bit over the next few weeks. I'm also trying to make it easier to manage multiple template styles. Most of the changes are behind the scenes to improve security and stability. The array of images in the Average and Transform windows have been replaced by the Finder. This required a major change to almost all functions, so please let me know when you find remaining bugs. You can now save new averages and transforms by dragging them into the Finder. From any folder in the finder, select File > Webcam Upload (W) to use your webcam to take a picture, name it and save it. Select files in the finder and select Actions > Batch Rename (N) to add a prefix, suffix, index, and multiple search and replace. We ask for your personal information to help with the development of WebMorph Online. We're always happy to hear from you about what sort of things would make WebMorph better or easier to use. Set a default project to use if you go straight to the Finder, Average or Transform Windows without choosing a specific project. Set a theme color for the interface. 0 is a light neutral color scheme. Go all the way to the right for the rainbow color scheme, and one tick before that for a dark neutral color scheme (these two are experimental and might be a little ugly). This shows small thumbnails in the finder. If you have many images in your project, this can slow down finder loading. The image format in which to save new images. You can always change the image format in any individual Batch process dialog. JPG: This is the default, as it has relatively small file size (we use the best-quality JPEG compression of 100), so a 1350x1800 pixel image will be about 0.5 MB. JPGs can contain embedded information about the image. PNG: This is uncompressed (we use the best-quality PNG compression of 0), so a 1350x1800 pixel image will be about 7.0 MB. This file type is good for very small images or for images where exact color is important. PNGs can also use transparency, so images with transparent masks are always saved as PNGs. GIF: This is uncompressed, but images are smaller than PNGs, so a 1350x1800 pixel image will be about 1.0 MB. Transparency is possible, but not as sophisticated as in PNGs. We mainly use GIFs as the frames for animated GIFs. This applies a representative texture to the average, resulting in composite images with more realistic texture instead of the very smooth, bland texture most other averaging programs create. See the papers below for methodological details. B. Tiddeman, M. Stirrat and D. Perrett (2005). 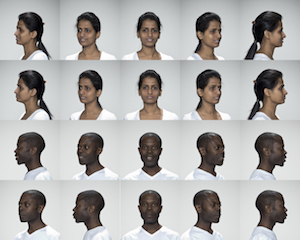 Towards realism in facial prototyping: results of a wavelet MRF method. Theory and Practice of Computer Graphics. B. Tiddeman, D.M. Burt and D. Perrett (2001). 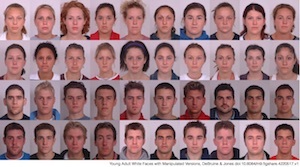 Computer Graphics in Facial Perception Research. IEEE Computer Graphics and Applications, 21(5), 42-50. This interpolates more control points along the lines. This can improve the accuracy of averages and transforms. If you see a ‘feathery’ appearance along lines that have many, close-together points, try turning this off. Linear: Implements triangulated linear interpolation for image warping. Linear warping is least accurate, often resulting in image artifacts, but is very fast. Multiscale RB: Implements multi-scale rigid body interpolation for image warping. This decreases image artifacts in some circumstances, but is much slower. This is the default color for masking, cropping, and rotation. Don't worry, you can always change it in the batch mask, crop and rotate dialogs. If you want to make a new project, choose 'New Project' from the File menu, or click P.
You can edit a project by double-clicking on the name or notes. Choose a project by clicking '[Go]' next to that project on the projects page (5). To switch to a different project, choose 'Current Project' from the File menu. Type a registered name or email address into that project's box in the Owners column. After you type a few characters, a drop-down list of options should appear. Choose the correct account and click the + button. That account will receive an email from the system notifying them that you have added them to a project. Click on the folders and files to navigate like you would in the Finder on your computer. You can also navigate with the arrow keys. If you want to make a new folder, click on the 'New Folder' button or click N.
You can change the name of a folder by -clicking on its name. You can upload JPG, GIF, or PNG files. You can also upload TEM files. You can upload any type of TEM file. You can select multiple files to upload at a time (up to a limit of 20 files and 64M). Click on the left pupil, the right pupil and the centre of the bottom of the top lip to set up the template. The default template has 189 points and is ideal for front-facing faces (the FRL-189 template). There are a few other templates for other purposes (e.g., FRL-bodies and Simple-face) that you can choose as a default template in the Preferences (,). 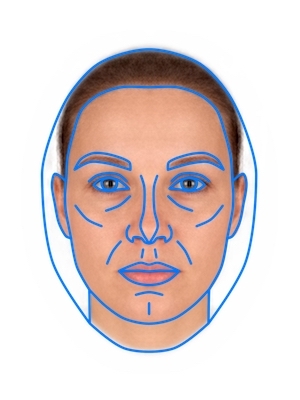 Move each point to delineate the shape of the face. When you hover over a point, its point number and location display at the bottom of the screen. Shift-click on a point to select or unselect it. You can move a group of selected points with the mouse or using the arrow keys. -click on a point to select or unselect the whole line. You can select more than one line and add/subtract individual points. Unselect all points using the ‘Unselect All’ button, clicking ⌃A or A twice, or by double-clicking on the face image. Select a group of points by dragging a rectangle around them. The rectangle won't show on the face yet (I'm working on it). You can register a template you uploaded from another version of WebMorph or a new one you created here. Registering a template allows you to use it to delineate new images and lets you set the point names and symmetry points. First, load an image with the new template into the Delineation Window by double-clicking on the image. Then, select the three points you want to use for 3-point delineation by shift-clicking on them. This only works if you select exactly 3 points. Next, choose New/Edit Template from the Template menu. Make sure that "Register this as a new template" is checked, unless you are editing one of your previously saved templates. You can't edit the public templates that you don't own (e.g., FRL-face, FRL-body, Simple-face). Give the template a useful name and notes. The 3 points for 3-point delineation will be automatically filled in from the points you selected. You can change or re-order them here. After you save the template, choose "Set Point Labels" from the Template menu. Each point will be selected in turn (and an arrow will point at it). Type the name into the box at the top of the screen and press return. Select the images you want to average together and click on the “View Average” button. Alternatively, drag the images you want to average together to the average face on the left. Large images (e.g., 1350px by 1800px) take about 5 seconds per image in the average, so be patient. If images are different sizes, you may want to change the default normalisation (under Preferences (,) Images) from "None" to "2-point" or "Rigid-body"
The size of the average will be taken from the first image in the average list. Drag the source images to the blank faces. Click on the button to see the “image to transform” transformed by some percentage of the difference between the “transform dimension” images. Select several images in the finder to transform them all the same way. Remember, you can only make transforms where all 3 images have the same number of template points. It takes about 10 seconds to create a transform with large (e.g., 1350px by 1800px) images.